A packed house at the Kate Buchanan Room. 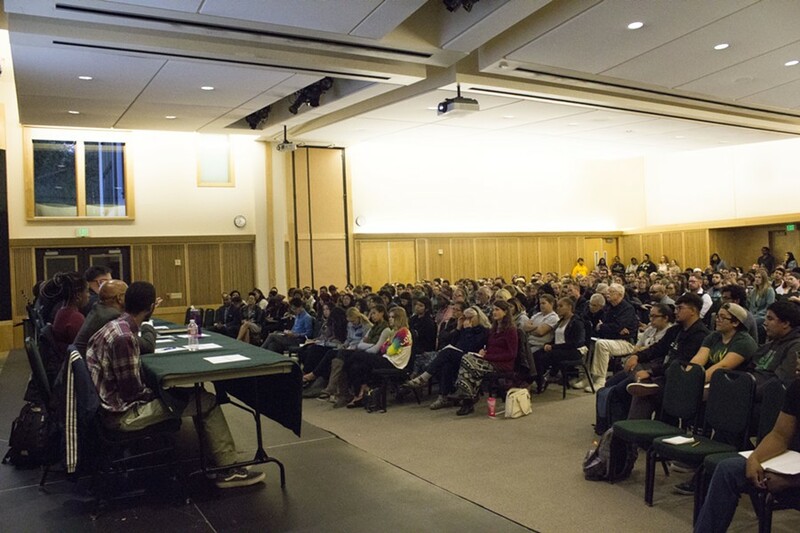 Against the national backdrop of a recent spate of high profile shootings of unarmed black people by law enforcement, students, police and community members gathered on the Humboldt State University campus Thursday evening for a far-reaching conversation on race and policing. Local law enforcement and members of the HSU black community sat side by side in the Kate Buchanan Room, discussing topics that ranged from police escalation to racism on campus. The audience filled the room to capacity, with speakers voicing concerns about police brutality and sharing first-hand accounts of racial bias. Among those was Gloria Brown, a child development major who spoke about the fears she faces just being around police. 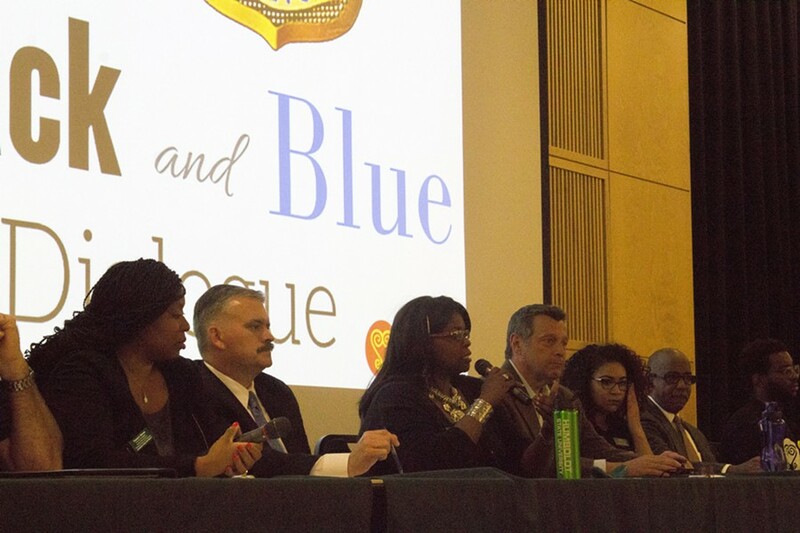 The 13 person panel at the Black and Blue Dialogue takes questions from audience members. Brown wasn’t the only one who shared these concerns. Amy Salinas-Westmoreland, director for the HSU Multicultural Center, said a fear of police has become a basic instinct. Questions directed at law enforcement ranged from how they deal with racial sensitivity to training protocols. University Police Department Chief Donn Peterson said the department has recently put an emphasis on de-escalation tactics and the topic is something he is constantly looking at. Students criticized some of the responses law enforcement gave, citing assumptions and misunderstandings that the black community constantly faces with police. Eureka Police Chief Andrew Mills spoke about how the department is trying to grow and overcome those assumptions. The audience also included several members of local police departments who were there to support, as well as gain insight from, the forum. HSU student Cameron Rodriguez and Humboldt County Sheriff's Sgt. 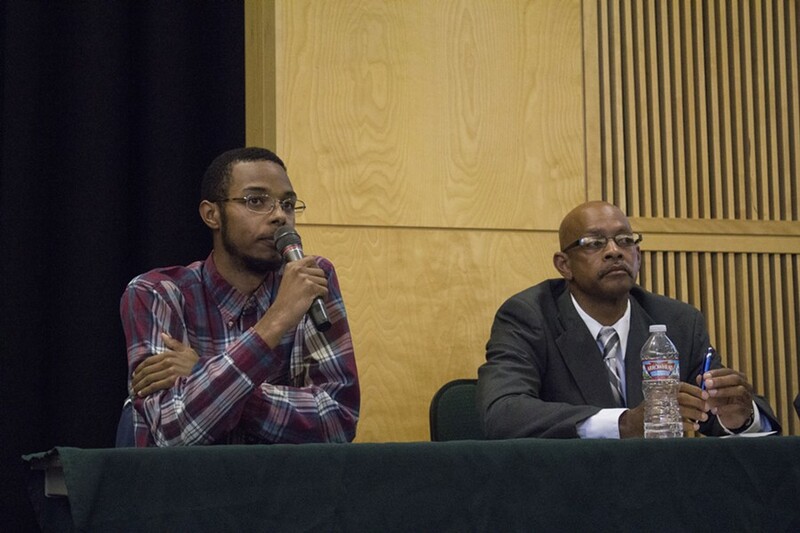 Greg Allen sit next to each other taking questions about police brutality and race relations at Humboldt State. The biggest applause of the evening came in response to Salinas-Westmoreland, who called out HSU administration for its lack of presence at the forum. She also referenced University President Lisa Rossbacher’s email to students this week that stated “racism is not a norm on our campus,” which drew laughs from students in the audience. The MCC director said the email was a slap in the face to students of color. The forum came to a close with a question to the panel asking what its members would take from the discussion going forward, and how they would apply it to their lives. Corlis Bennett-Mcbride, director for the Cultural Centers for Academic Excellence at HSU, summed up the forum by tackling an issue many people agreed upon.